If you’re new here, or perhaps read occasionally but are interested in reading more, this is a recap of some of my most popular posts. You can also follow Between Worlds on Facebook by clicking Like in the Facebook sidebar to the right or visit the Between Worlds Facebook page. You can also subscribe by email in the sidebar to the right to get new posts delivered directly to your inbox. We want to say that everything that happens in church is about Jesus, but it’s simply not. There’s a whole lot of culture and power and history and social structure in there as well. Until we acknowledge how these realities shape our thinking, we’re going nowhere. Yours is a story of dominance, of disrespecting and denying others’ rights and conquering those who are inconvenient to you. 1. We don’t know how to talk about race. 3. We need healing, too. 4. We’re afraid of losing control. As we’ve raised biracial children, we’ve searched long and hard for toys and books that reflect a wide variety of experiences, backgrounds and perspectives. It hasn’t always been an easy or successful effort, but it’s been an important way we affirm this piece of our children’s identity. 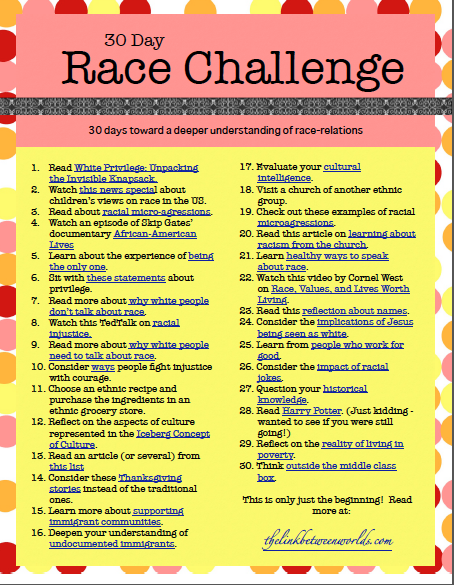 30 day race challenge: infographic linking to resources for people wanting to develop a deeper understanding of race. 101 Culturally Diverse Christian Voices: listing representing the wide variety of Christian voices speaking about or living out their faith in the public sphere. Iceberg Concept of Culture: One of my favorite ways to teach culture. I know firsthand that you don’t easily know what to do with people who are not like you. Our biracial and bicultural and multilingual-but-English-speaking family lived among you in a tiny little cornfield town for 8 long and painful years, enduring glares and scowls, holding hearts and sighing wearily with the very-few-others-like-us. You love yourselves well, but you did not love us at all. What to buy in an Indian Grocery store for dummies: a guide to basic ingredients for cooking South Asian style food. 9 ways to help children develop global awareness: Check out these ideas that include books, videos, service, travel, hospitality, generosity, imagination, simplicity. While comparatively few are called to such an intimate cross-cultural partnership, all Christians have a responsibility to seek reconciliation across barriers. A long(er) view of intercultural marriage. Exploring characteristics of ‘deeper intercultural marriage’: grace, insight, sacrifice, flexibility, patience, patience, honesty, friendship. The dementia had stolen him from us one-slow-day-at-a-time, and replaced his jolly warmth with violent reactions and confused arguments. It was like having a three-year-old in the family all over again. Though I cannot promise you it will be a simple path, I can attest mightily to its richness and depth. For in every failure, there is forgiveness, in every brokenness – healing, and in every sorrow – restoration. It will surely not appear in the ways you expect, nor as easily as you hope, but as you walk in Christ’s way, it will come, steadfast and sure. In the earliest years of parenting, our decision to travel with our children was merely a hunch that it would be good for them in the long run. “Start as you mean to go on” became our motto, for we wanted the world to be something that was as much a part of them as their hometown, and we knew that to do this, it should be something they had always known. The warm breeze blew romantically that evening, enticing me to relish that moment of my children dancing, twirling in their joy-filled innocence. It will not last long. I’d now climbed right up on my own soapbox behind Annie, fully entrenched in my private choruses of “You go, girl!” She’d hit the nail on the head. These rogues – they were crazy. They converted unethically, didn’t think about anything critically, and threw their Bibles around carelessly defending their narrow-minded political causes. Truly, the heart is deceitful above all things; and it was in marriage that we finally were forced to face our long denied deceit of stubborn habits, selfish expectations, and unrealistic dreams. Truth-tellers are wired to poke holes, ask questions, point out inconsistencies, question accepted norms – often for the value of the greater-good, but usually at the cost of keeping-the-peace. From the movies, I learned that love was a magic carpet ride full of wonder and adventure, a prince arriving to save me at just the right moment, or swirling around a ball-room in a place I didn’t really deserve to be. I learned that ‘being in love’ meant swooning emotions, pretty dresses and palpitating hearts. There were no Disney movies, however, about crying angrily on the way home from church or getting up with screaming babies six times in the middle of the night or being overly snippy with your spouse. Sometimes, I wondered if the enduring years would ever end. As the years have passed, I’ve discovered ways of walking with God that offer more sustenance than my questions. These paths are why I’ve stayed, and why I continue to seek life in Jesus even when I don’t fully know all the answers. Still want to read more?!? Check out my monthly compilations of some of the best reads on the web here.